The summer melt season in the Arctic is approaching its annual climax — the sea ice minimum, due in September — and the picture is beginning to look grim. 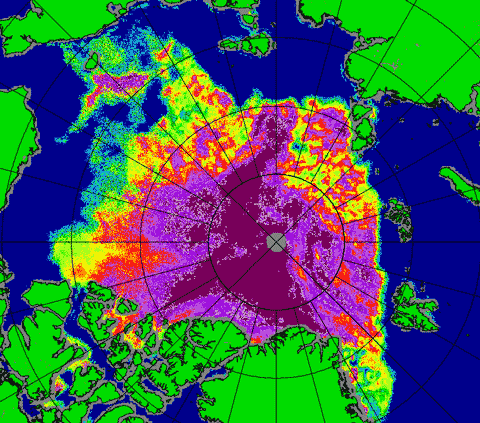 Sea ice extent and area are tracking 2007′s record-setting melt, ice volume is at record lows for the time of year, and the ice is looking very fragmented, making it vulnerable to rapid melting events. To make matters worse, a large storm is brewing over the Arctic ocean, and is likely to create a surge of ice loss. 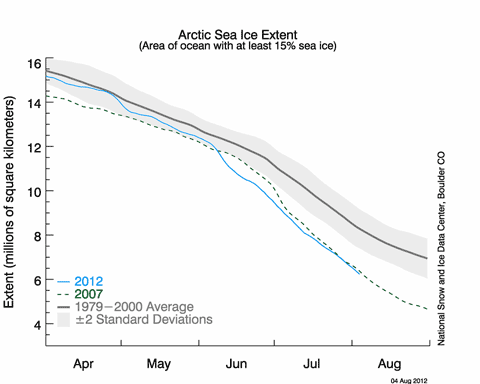 2012 could be heading towards breaking 2007′s record minimum, and that’s bad news for the entire northern hemisphere. This year’s ice area dived well below previous years a month ago (check the interactive graph, and follow the yellow line), and the anomaly — the difference from the long term average — has been bumping along at about 2 million km2 below average for a month or more. The Northwest Passage looks certain to be open via the northern McClure Strait/Parry Channel before too long, and the Northeast Passage/Northern Route over Russia, blocked by lingering ice in the Chukchi Sea, may be open soon. The large area of diffuse ice in the Chukchi and over the East Siberian Shelf is most vulnerable to rapid melting, but the large areas of yellow and green to the north of Alaska and Siberia are areas of lower ice concentration that may prove vulnerable over the next few weeks. 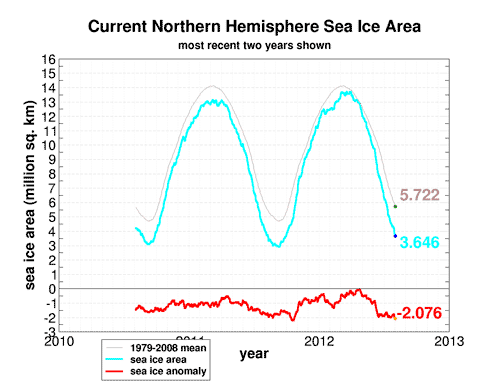 As ever, the best place to follow the melt season on a day to day basis is Neven’s Arctic Sea Ice blog, and the best quick daily overview is provided by the sea ice graphs compendium he maintains here. I gave up betting on sea ice a few years ago, but if I had any truffle money burning a hole in my pocket1, I’d be very tempted to back 2012 to set new extent and area record lows. Other bloggers taking an informed interest include the loveable lagomorph and Tamino at Open Mind. And if you’ve ever wondered why this might be important, take a look at this short2 video of a presentation by Jennifer Francis of Rutgers University, at the American Meteorological Society in January: Does Arctic Amplification Fuel Extreme Weather in Mid-Latitudes? I’ll spoil the punch line: the answer’s yes, but Francis provides an excellent discussion of why this might be.